All evidence points to the off-the-shoulder top being the It item of 2016. But now, as it turns out, it's also the trend of choice for wedding dress styles. And that's only going to last into the new year. Brides magazine has just revealed that this look is the number one trend for wedding dresses right now, with its popularity carrying on into 2017. According to the publication, the off-the-shoulder wedding dress "continued to reign supreme" at Bridal Fashion Week, and we can see why. It shows off just the right amount of skin without being too showy. Not only that, once you're done wearing it on the big day, you can still get some wear out of it, such is the more casual look of the item. And if you wanted more proof this is the style everyone's been looking for this year, searches for "off-the-shoulder wedding dress" were neck and neck with "strapless wedding dress" in September, proving the latter's popularity might be waning. Other trends that are going to be big next year include ruffles and fully tiered skirts, as well as the bold bridal accessory making a comeback too. Sounds like anyone who's going to be a bride in 2017 is going to seriously enjoy choosing their dress. Keep scrolling for our pick of some incredible off-the-shoulder wedding dresses you can shop right now. Self-Portrait has a range of very affordable bridal dresses, and you can definitely wear this one after your nuptials. Super-pretty lace for the romantic bride. Want more? 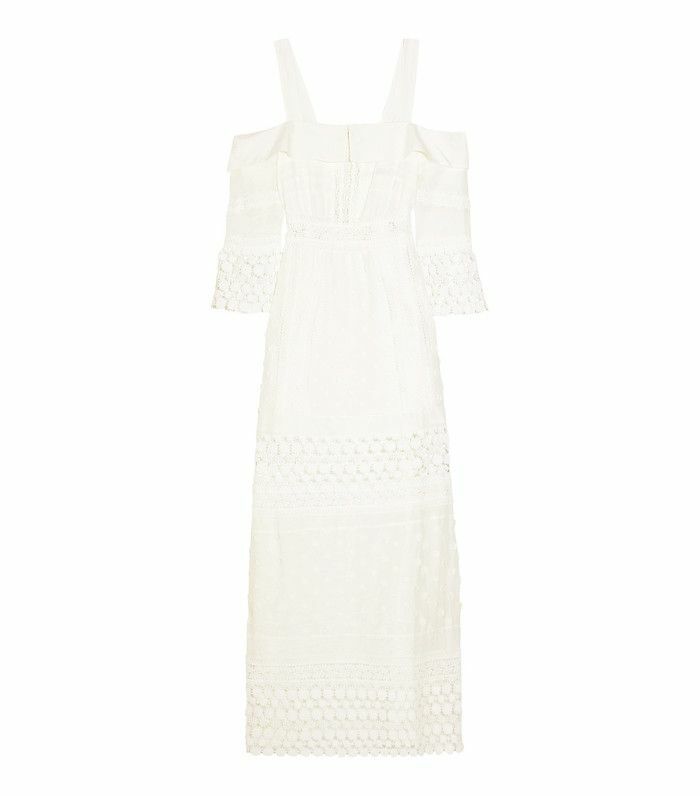 High street wedding dresses have never looked so good.